“I have a very vivid memory of our first encounter,” says Toshi Tajima, speaking of Professor Norman Rostoker. Throughout the years, Tajima learned more than science from this world-renowned physicist. Tajima, ‘75, came to UC Irvine in 1973 as a Ph.D. student to join the group of the professor. Prior to his arrival, Tajima was studying physics at the University of Tokyo in Japan. “It was my aspiration for broader liberty,” says Tajima when asked why he chose the U.S. as the place to obtain his Ph.D. In addition to his optimism and adventurous spirit, Tajima was drawn by the buzz of the scientific reputation of Dr. Rostoker. His mentor in Japan, Dr. Setsuo Ichimaru, a collaborator of Dr. Rostoker, encouraged him to apply to various universities but strongly recommended he pursue his studies alongside Dr. Rostoker. Tajima had offers from Princeton, MIT, and Harvard. At the time, Dr. Rostoker had two major scientific ventures brewing in the labs of UC Irvine. Research was being done on plasma-physics-based accelerators as well as nuclear fusion. Prior to his arrival to UCI, Rostoker was involved with prominent scientific foundations such as Carnegie Mellon, the Illinois Institute of Technology, General Atomic, and Cornell University. He is well known for the invention of the fusion reactor that combines accelerated beams and plasma that harbors them. He led the establishment of Tri Alpha Energy, embodying his idea to develop fusion energy generation without neutrons (aneutronic fusion). Fusion power plants can provide clean, safe, cheap and unlimited power. A fusion reactor and an Olympic-sized swimming pool filled with water could provide enough power for the state of California. As a plasma physicist, Tajima toiled in the basement of the engineering building where he was heavily involved on the side of Rostoker’s fusion research. Shooting pool with his fellow graduate students at night was also part of the routine. During this time, Tajima also learned Rostoker’s plasma accelerator ideas, which led to his later invention of laser accelerators. Tajima completed his Ph.D. in 1975, becoming one of the first graduating doctoral students from Rostoker’s group at UCI. He performed his postgraduate research at UCLA where his work continued fusion research along with some of the accelerator works dawned at Dr. Rostoker’s lab. While at UCLA, Tajima co-published the most cited paper in plasma physics on laser acceleration. In 1980, amidst the U.S energy crisis, the country created a national center, the Institute for Fusion Studies, to bolster fusion theory. Among many competing universities, the University of Texas, Austin (UT Austin), was chosen to host the center, where Tajima served as a founding faculty member. Throughout the years, Rostoker was also involved with the Institute. Tajima left UT Austin in 2001. Tajima was called back to his homeland to direct research in Kyoto, and years later to Europe, where he helped launch and crafted research programs in large bourgeoning intense laser labs that prominently included his laser acceleration research (at the levels of $500M and $1B, respectively). Last year, Tajima came full circle back to UCI. He serves as the Norman Rostoker Chair Professor in the Department of Physics & Astronomy and is Chief Science Officer at Tri Alpha Energy. Tajima’s 88-year-old mentor received the 2014 Outstanding Emeritus Award from UCI’s Emeriti Association on Monday, June 2nd. Witnessing the touching ceremony was Tajima along with many other former students of Rostoker. 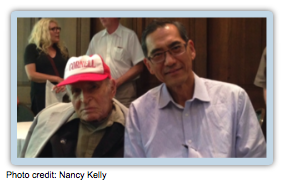 Tajima plans to make Irvine his final home and continue carrying Dr. Rostoker’s legacy. “I have a lot of work to do here,” he says.